Slate roofs are among the most beautiful and durable materials available. As a traditional, natural roofing material, slate provides beauty, high fire resistance, versatility and strength. A slate roof increases your home's aesthetic appeal and value. Slate is unparalleled in design, longevity and energy conservation. Our skilled craftsmen at GF Sprague have worked on thousands of slate roofs in the area and they know how to analyze and address any circumstance or problem. We are able to provide a cost-effective solution for your slate roofing application. Call us today at 1-781-209-6791 or click below to learn more about slate roofing installation for your home. We offer free estimates on all our work in Newton, Needham, Wellesley and throughout the surrounding areas. The original copper cap had started to leak so we removed it and replaced it with a custom fabricated copper cap fastened with stainless steel screws and brass washers. Poor maintenance, simple neglect or the use of inappropriate repair materials like tar or caulking, which can trap water causing rot and leaks. At GF Sprague, we believe that slate roofing is a true "lost art." Our slaters and coppersmiths have the experience in working with slate and copperwork to get the job done right, and to provide you with a beautiful, durable roof. Even the best slate roofs do require upkeep. 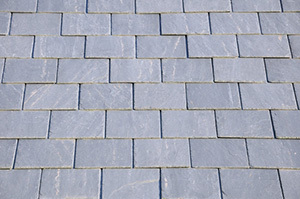 For example, all slates will split under the pressure of expanding ice. Also, metal flashings that are critical to keeping water out will wear away after about 50 years. Therefore, it is critical to conduct a regular inspection and maintenance schedule every three years, or whenever you notice missing or broken slates, or when you see can daylight through the roof. If left unrepaired, your roof will deteriorate beyond the point of simple repair. At GF Sprague, we truly recognize and appreciate the value of your roof and have the expertise to repair it so that you can enjoy leak-free protection for many years to come. We are experienced in working with a wide variety of roofing materials, and we can provide you with expert slate roof repair or installation. Call us today at 1-781-209-6791 or contact us online to get a free estimate on slate roofing services in Newton, Needham, Wellesley, Chestnut Hill, Weston, Boston, Brookline, Quincy, Watertown, Cambridge and throughout the surrounding areas.